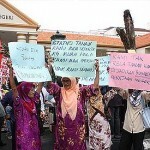 penang anti lynas protest – welcome! 26 feb. 2012. kuantan see around 15,000 people gathered to protest, while other states like KL and sarawak, people were protesting in solidarity too. penang had its protest at speakers square, esplanade. very good turnout – about 500. however the programme was disrupted with the turnout of some UMNO samseng! (gangsters). about 50 of them… many wearing the umno 1malaysia t-shirt. they were very noisy and disruptive. when the organiser wanted to speak, they shouted and drowned the organiser, so the organiser had to move away, together with the crowd… but after some time, they came to where the organiser was giving a speech and disrupted them again. 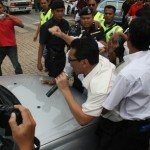 while the protesters shouted "stop lynas" the shouted "we want lynas". when those goons heard the protesters shouting "stop lynas" they said "then get out of malaysia". oh gosh, is that all they can say? yes i notice so many times umno gangsters have nothing solid to say in an argument but always like to say "get out of malaysia". 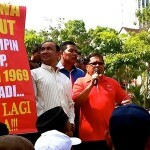 these stupid umno gangsters why is it they always like to disrupt NGO organised protest? remember the anti-ISA protest – one at esplanade too and one at komtar walk – the anti ISA people organised it but they, the pro ISA people, the umno goons, came crashing in and disrupted the peaceful protest. why can't they organised their own pro ISA protest or now pro lynas protest? really idiots! they really show to the world that they are gangsters, if they keep disrupting protests. i hardly (or maybe never?) see such things happened in other countries. only in bolehland it happens! 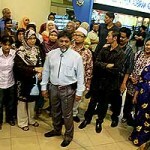 it seemed that in this anti lynas protests, two reporters were hurt when the umno gangsters attacked them with helmets. see, they were playing rough! as if verbal abuse not enough but they have to resort to physical harm. what to do… only gangsters will act this way – verbal (and vulgar too) abuses and violent physical harm. ok i will let you read what happened in penang from susan loone's article in malaysiakini. NOTE: i wanted to post photos here but it seems that something's wrong with my blog (as again) which made it that i can't post the photos… but i will still try again later. in the meantime please see all the photos i have taken (over 100) at my facebook photo album. The Penang leg of solidarity gatherings for the Himpunan Hijau 2.0 rally in Kuantan was the sole event which saw disruptions, with two journalists hurt during a fracas that erupted at the rally. Himpunan Hijausupporters began gathering at the Penang Esplanade were met by a hostile group, which includes local leaders from Umno Youth and Malay rights pressure group Perkasa, numbering about 50. Several members of this group have often been spotted at anti-Penang Chief Minister Lim Guan Eng rallies organised by Suara Anak-Anak Malaysia and Komtar Traders Association vice president Abdul Ghani Mohammed Jiman. When the event kicked off at about 6.00pm, the hostile group began jeering Himpunan Hijau supporters and telling them that this was not a “Penang issue”. Some shouted “HidupUmno”, "Hidup BN", “We want freedom” and “Balik Kuantan (Go back to Kuantan)”. Several Himpunan Hijau supporters who offered to debate with the hostile group were shouted at, pushed and told to stop their protest. By this time, the Himpunan Hijau crowd that swelled to about 500, retorted by chanting anti-Lynas slogans, and “Hidup rakyat (Long live the people)”. By about 6.15pm, no police were in sight despite the intense shouting match which ensued. Penang executive councillor and Tanjung MP Chow Kon Yeow who was first to address the crowd, saying that the freedom of speech of both pro and anti-Lynas supporters must be respected. However, Chow said if the pro-Lynas supporters wanted to express their views, they could have organised another protest, instead of "harassing and disturbing" their opponents. "The pro-Lynas supporters say this is not a Penang issue. But this is not a political issue, it is something that concerns all Malaysians," he said. "And if this is not a Penang issue, then why are they shouting here?" he added. Penang chief minister Lim Guan Eng arrived at the scene at about 6.30pm and addressed the Himpunan Hijau supporters, affirming Pakatan Rakyat’s stance against the Lynas rare earth refinery in Gebeng, near Kuantan, because of potential radioactive hazards. He also urged the crowd not to be cowed by the opposing group gathered just near by. Upon hearing this, the hostile group showered Lim with a barrage of vulgarities and popular Hokkien swear words, prompting Himpunan Hijau crowd to boo them. They also continued chanting "Guan Eng penipu (liar)" and asked him to return to Malacca, the CM’s place of birth. The hostile group also shouted at the CM to "please settle Penang problems first, before talking about issues in another country or state". However, Lim braved all the obscenities, and told the crowd that those who supported Lynas did it for the money as the company benefitted only Umno cronies. Following this, Lim attempted to leave the stage and join the crowd but the hostile group started to push participants and a fracas ensued. According to eyewitnesses, two journalists from local Chinese daily Kowng Wah Jit Poh – Adam Chew and Lee Hong Chun – were struck with motorcycle helmets. Lee, when met later, said his head was injured, and that he was hit by the pro-Lynas members while snapping shots of the group trying to stop Lim's car from leaving the field. The police finally moved in at about 7.15pm, blaring sirens and demanding that the crowd disperse. Unlike Penang, other solidarity rallies in major towns and cities elsewhere proceeded smoothly. In BUKIT MERAH, Perak some 1,000 people gathered at the former Asian Rare Earth (ARE) refinery at 11am for a 90-minute rally to show support for the Kuantan counterparts. Rally organiser Hew Yoon Tat, when contacted, said he gave a speech during the event where he reminded the public that the cleanup works for the now defunct ARE was still ongoing and thus still pose a danger. “The government should put a blanket ban on rare earth processing factory,” he said. He said past experience with the ARE have caused doubts with the assurances being given over the soon-to-be operation Lynas plant. Back in 2003, Bukit Merah residents were told that two years were needed to decommission the ARE. “He said the reason being is the factory needed to be torn down part by part so that the radioactive waste would not go into the village. “How come last time when it was in operation you claimed it was not harmful and now you said it is harmful?” he asked. In KUALA LUMPUR, some 500 people gathered in front of Maju Junction shopping centre (above) along the busy Jalan Tunku Abdul Rahman in a three-hour gathering. It was a festive atmosphere during the gathering which saw participants singing songs and displaying their placards for oncoming vehicles, encouraging them to honk in support. Other than musical performances, some participants also donated small locks of hair which was later used to spell out the phrase “Stop Lynas, save Malaysia” on the sidewalk. In KUCHING, Sarawak, some 30 protesters converged at Taman Sahabat, Jalan Song for a solidarity rally, but was forced to cut it short to about 15-minutes because of heavy rain. Organiser William Lee drew comparisons between the Lynas plant and the country’s the first aluminum smelter in Balingian, Sarawak which has caused plants within 3km ratio to die. He warned that a similar scene might happened in Gebeng. There are also reports of solidarity gatherings being held in Tawau, Kota Kinabalu, Sibu, Miri, Kluang and even as far as Melbourne.